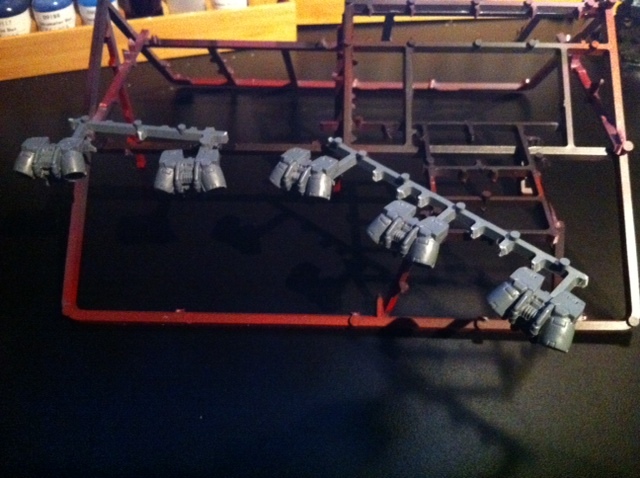 Jump pack painting rack | 30mm Madness! I had previously built a ‘spraying rack’ to get the first rhino I built up off the bottom of my ghetto card board airbrush booth. It looks kinda’ impossible to paint the shoulder pads of the marines with the jump packs on, so for now I’m going to paint them separately… to make that easier and to ensure that I get the airbrush highlight angle correct, I added on to my airbrush paint sprue framework. The jump packs themselves are attached to the sprues with poster-tack, so should be easy to remove them once they have the base coat and highlight coat in place. This entry was posted on March 9, 2011 by justinhardin. It was filed under Blood Angels, Modeling & Painting, Warhammer 40K .